Running and dancing are activities that sometimes involve injuries. It is really upsetting to get one when you’re at your best. However, there’s a solution! Stretching exercises improve your flexibility which makes your body less susceptible to traumas. In addition to that, they boost your health and overall well-being. Well, this is a nice piece of info – lots of people know it. The most challenging part is always to put a theory into practice. Fortunately, there are apps that will help you to make stretching exercises a part of your daily routine. Look no more! The list below covers all the best guides on how to get a strong back and a nice stretchy body. Let’s begin! 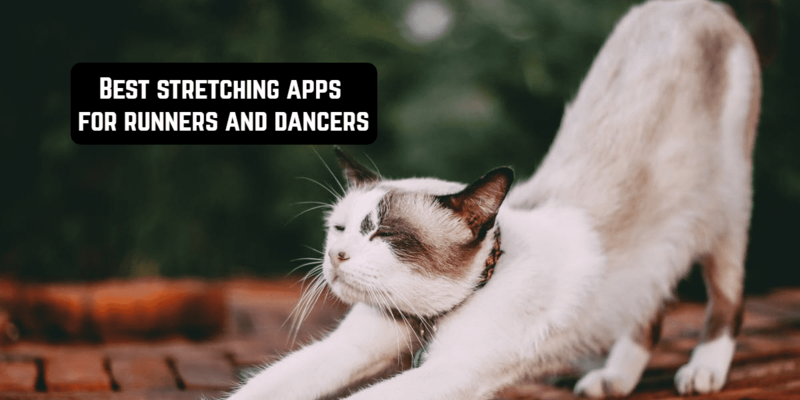 StretchIt is an excellent app for all the types of performers – it includes pilates, dance, gymnastics techniques and many others to help you become a real pro in your craft. StretchIt features 40 hours of stretching and flexibility video classes, but don’t worry – you won’t be exposed to it in raw form – there are special pieces of training divided by length: 15 minutes, 30 minutes, 45 minutes. Besides, there is a 30-day program that will provide you with exercises every day. One more feature of the app is the ability to track your progress. It is really motivating when you are able to see what you’ve managed to accomplish. Training calendar and notifications (if needed) are included as well. 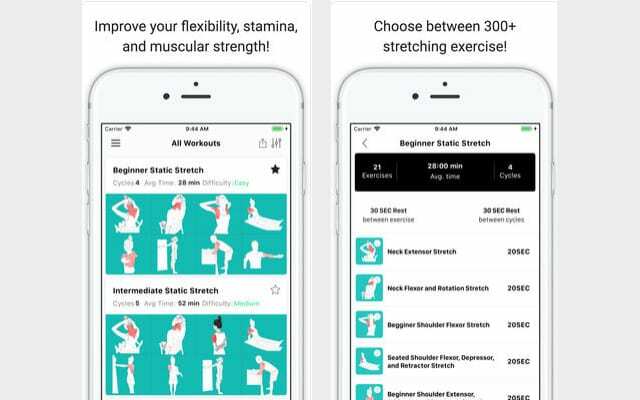 So, this is a very useful app for anyone who needs stretching in their daily routine. And the most awesome part is that it is not just for beginners. Anyone can find something useful. Download the app right now and use a 7-day free trial! 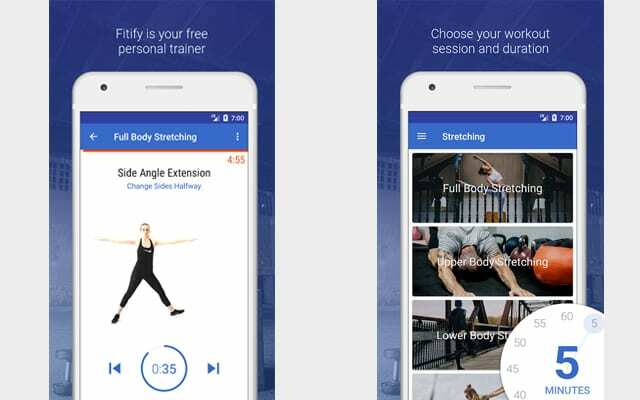 Fitify’s app for stretching and flexibility is only for Android yet. However, since there are lots of Fitify apps present on both platforms, there is a big chance that this one is also going to be introduced in the App Store. The app offers you four types of training – full body, lower body, upper body, back stretching & release. Upon the whole, there are over 65 different stretching exercises that are combined in different ways. You can even create your own custom training that will suit your individual needs and that you will truly enjoy. For all the pieces of training, you can choose length – from 5 minutes to an hour. All the pieces are provided with an audio coach and HD demonstrations of the moves that you have to do. The app’s interface is clear and user-friendly. There are ads but they don’t annoy you that much. Besides, you can get rid of all the inconveniences and limitations by buying a premium. All in all, this is a very smart and modern app that is, on the one side, simple, but on the other, extremely convenient to deal with! Stretching and Flexibility Plans is a great alternative for Stretching and Flexibility Routines. While the later app is on Google Play, this one can be downloaded just from the App Store. 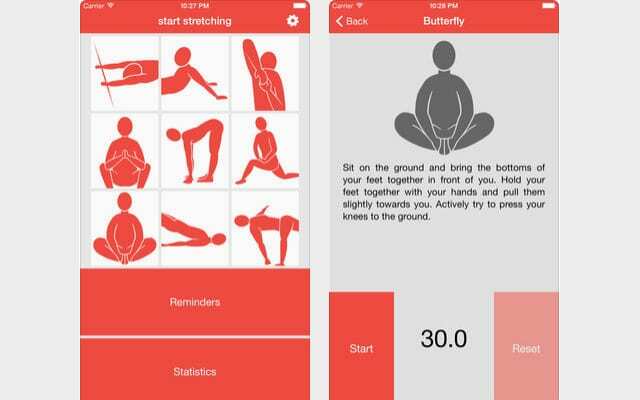 The app has about 300 stretching exercises and 50 stretching routines. If you like, you can create your own personal routine. The coolest feature of this app is that it not only gives you a short video of an exercise but it also provides you with written instructions on how to do everything right. This is extremely important in stretching since many beginners make a lot of mistakes at the start. By the way, the app is not just for beginners – everyone can find something useful. I guess, it refers to all the stretching apps in some way. Besides the exercises, there are such features as body tracker, calendar, weight progress, etc. – all the usual stuff included in fitness apps. So, if you are lucky enough to own an Apple’s product, definitely try this one! Stretching Sworkit is one of the Sworkit fitness apps – the other ones are devoted to such training types as cardio, strength, yoga, etc. Stretching app is all for stretching. It includes over a hundred workouts and guided plans to help you get slimmer and more flexible with every day! One training lasts for just 5 minutes which is perfect for those who don’t usually have lots of time. There are three types of training – full body, heel to toe, and pilates. 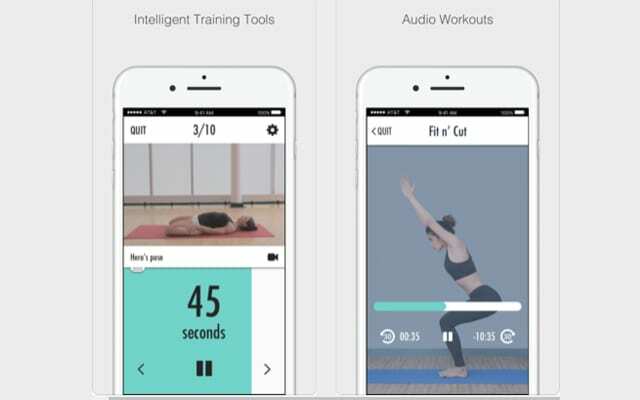 You can also create your own personal training which would involve different areas – for example, you can combine stretching, strength, and yoga exercises all in one in order to get a holistic full training – this one, however, requires other Sworkit apps, at least on iOS. Sworkit series is one of the best fitness apps. If you want to try something new, this is a good option to start with! 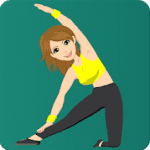 Flexibility & Stretching or ‘Flexibility Workout Exercises’ (a Google Play’s name) is an app that features a stretching program that will step by step lead to the body of your dreams. To be flexible equals to be graceful in dancing and to be resilient in running. In order to reach success in any of these activities, you need to stretch, stretch, and stretch. The program of the app will help you do that. All the exercises are provided with audio guidelines and short video demonstrations. In addition to that, there are previews for every exercise so that you could learn what to do next before the timer goes off. An excellent feature! So, just one more cool stretching app. Running can be dangerous. Recent studies show that one needs to be cautious with this type of training. If you love running though, it is not necessary to give it up – just take on a couple of measures to prevent traumas and feel better. One of such measures is doing warm-ups and cool-downs. This simple app is designed exactly for that. It gives you a number of warm-up and cool-down exercises provided with audio instructions. All you have to do is follow the lead. The app’s interface is user-friendly and simple. The app might not have lots of complicated features but it is very useful if all you need a stretching app is to get ready for a run. Take care of your health – download RunnerStretch today! This one is for Android. Strong Runner is an app that is full of video exercises for warm-ups, cool-downs, stretching, and so on. Besides the exercises, the app includes a 5k running plan and descriptions of most common injuries that may occur during running. In sum, this is an app that explains what kind of injuries you can get and helps you avoid these injuries. The app is simple from an interface to content, but it might be a great start for those who just entered the game. Stretch HD is a practical guide for everyone who wants to get rid of the pain with the help of stretching. The app contains 60 stretching exercises illustrated in HD videos. By the way, these videos make the app quite heavy, so make sure you have enough space for downloading something like this. HD videos go together with instructions written by professionals. The instructions and the theory behind stretching routines make this app stand out from the rest – knowing why you’re doing something gives you additional motivation, so it is definitely an advantage. 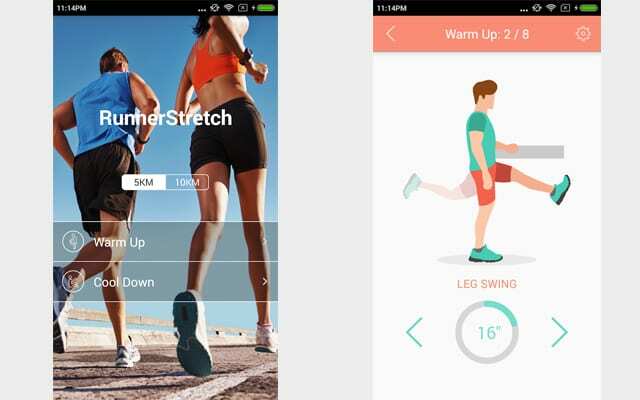 Using this app, you can also create your own personalized training to work on the areas that are the most important to you – for example, both runners and dancers need to do back stretches, whereas some other particular stretches are important only for the dancers and not for the runners and vice versa. You can choose the exercises by area, which is one more advantage. A ready training can be sent via email – it is very convenient because you can coordinate your exercises with a trainer, a doctor or someone who knows better. All in all, this is a great app for those who need stretching! 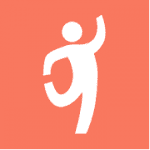 This Android Stretch app is a great tool to help you incorporate stretching into your daily routine. It is suitable for everyone – young and old alike, sportsmen and beginners, professionals and those who just want to stay healthy. The app includes different daily routines to help you enter the game. Upon the whole, there are lots of exercises that are demonstrated in short videos and provided with short and concise descriptions of how to do them & why it is good for you. The Stretch App is a community app which means that you can find like-minded people with whom to share photos and useful information. Or, you can just read what others are writing in order to learn new information and become more knowledgeable about the topic of stretching. Last but not least is BMI calculator that will help you track your weight and observe your progress. So, this is an amazing app for Android devices. A really nice one to try! Pilates is a complex of exercises created in the 20th century but widely spread at the beginning of the 21st century. It is good for all the people regardless of the age group you’re in or the level of your physical capabilities. Most of the exercises are in substance stretching exercises. 5 Minute Pilates Workouts is a great app to help you start practicing Pilates. All the exercises in the app are provided with clear animated demonstrations which ensures the right implementation of the theory. So, if you are up to try something new, go ahead and get this pilates app! 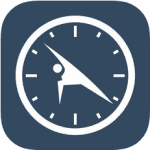 Pilates Lumowell is one more app for daily pilates. 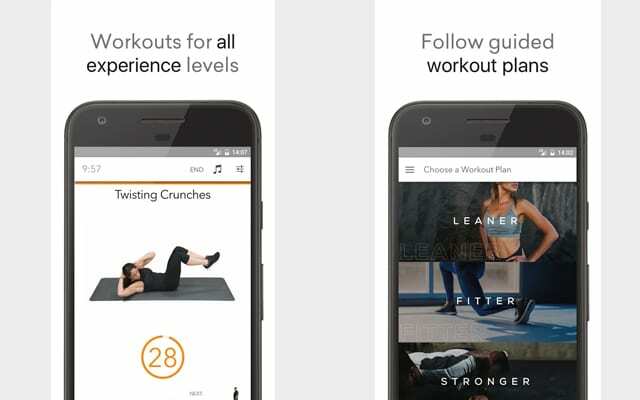 The app features a whole program of exercises. And not just that. A virtual trainer that you can see in the picture below will explain to you how to burn weight more efficiently. 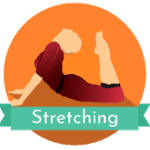 That said, of course, we don’t forget that the aim of this article is to list stretching apps. This one is partly a stretching app as well – it includes stretching routines and cool-down routines that you can use either separately or after doing other sets of exercises. Besides, the app includes previews to exercises which helps you do them properly, calories counter, goal setting, and even a meal planner! So, it is like a true trainer in your pocket. 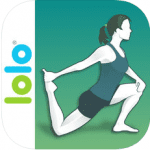 By downloading this app, you do not only get a stretching app, but also a very versatile fitness app. Start Stretching is a cool app for iOS. Is cool because it is done in a very creative way. 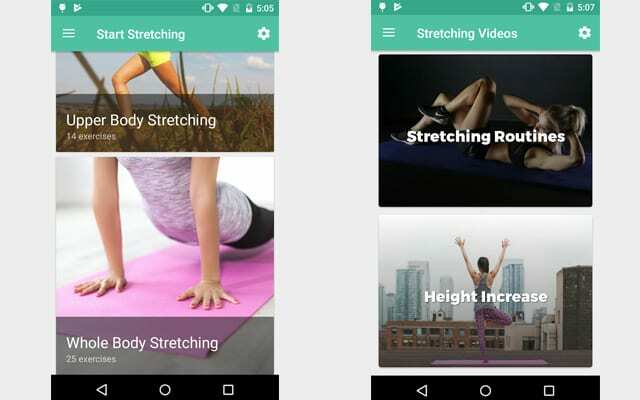 So, basically, it is a regular stretching app that contains basic stretching exercises practically anyone can do, but these exercises are not demonstrated in videos – only stylized pictures and carefully written texts to convey the essence or the gist, whatever. In addition to the exercises, there is a timer – you can choose how long you would like to hold this or that pose and how long you want your overall training to last. The app collects the info of how frequently you use it in order to provide you with statistics. So, a good start for the beginners. If you like things done is a certain style, this one is perfect for you! 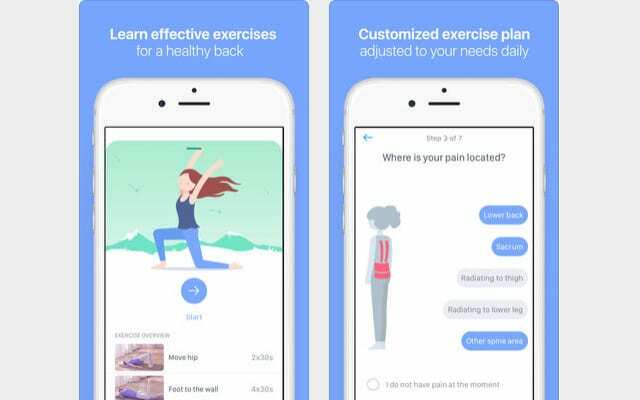 If you are not a beginner and already know lots of stretching exercises and can do them right, you probably don’t need a stretching app that much. You need a timer app instead! 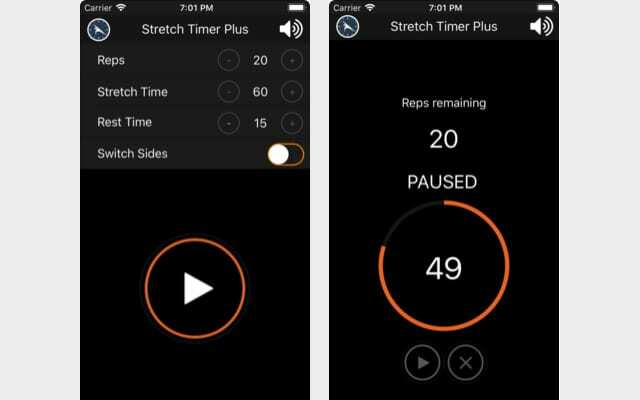 Create your stretching routine yourself and go through it with the help of a fitness timer. Fitness timers help you concentrate on the exercise instead of fussily counting seconds on when to finish it. This one, in particular, is designed for stretching, but all of them are suitable for different types of exercises. So, just choose the one you like most and enjoy stretching without watching same old video demonstrations over and over again! Yoga, stretching… What difference is there? Apart from the obvious spiritual element in the former one. Anyways, yoga definitely contributes to your flexibility, makes you stretchy and healthy. So, why not to consider getting a Yoga app? Track Yoga is an excellent choice! It includes special Flexibility series which is exactly what we need. And, of course, there are many other yoga classes you can try as well. The app will guide you through all the exercises and help you reach the form that is necessary. You can set weekly goals and reminders to keep yourself motivated. Besides, there are special badges that you get for certain achievements. So, if you don’t have any preconceptions about yoga, try this app! It will improve your flexibility. Back pain is a frequent consequence of overtraining. Both runners and dancers sometimes have to deal with this problem. Stretching helps here as well, however, it is necessary to select the right exercises that will lead you from terrible inconveniences to a healthy state of being. Kaia is the app created just for that! It includes special exercises for people who have different levels of physical ability. So whether you an athlete or a normal human being, you can choose the exercises that suit you best. Besides the exercises, Kaia includes tips and tricks on how to avoid back pain or make it less troubling. There are also regular sets of exercises that last from 15 to 30 minutes – they prevent your back from being hurt in the future. Get the app right now and get rid yourself of discomfort! Just for iOS. The developers of Performance Stretching claim that static stretches don’t work when it comes to warm-ups. The right way to do stretching before involving in a more intense activity is dynamic stretches. Dynamic stretches help the body to get ready, prepares the muscles, improves blood circulation and many more. The app includes 150 different exercises with videos and audio explanations. There are warm-ups, cool-downs, relaxation techniques, and so on. So, if you prefer dynamic stretching, this one is for you! In many cases, it is really more beneficial. Just for Android. Stretching exercises for the full body is great for everyone. It is simple and easy. 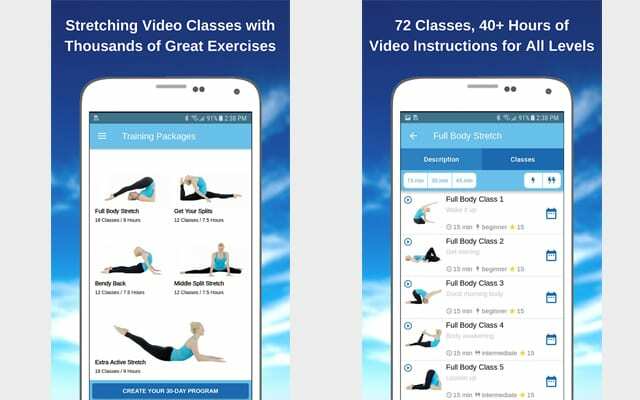 The app contains 60 exercises that are divided into several groups such as full body stretches, upper body stretches, lower body stretches, legs, shoulders, etc. Of course, sometimes there are repetitions. The app also has 3 programmes, so each day you can do a stretching workout to keep your body in good shape. All the exercises are provided with text, audio, and video instructions. With this app, you can also watch your progress. Practice every day and your flexibility will considerably improve! If you are a beginner, this is a nice one to start with. Those were the best stretching apps. Hopefully, now you know what to use in order to upgrade your stretching skills. Stay tuned & be smart in choosing apps!